If you caught the “Disney Parks Magical Christmas Celebration” on ABC earlier this week, you may have seen this amazing sneak peek into one of Walt Disney World’s most exciting expansions: the construction of Pandora – The World of Avatar, which will open at Disney’s Animal Kingdom this summer. 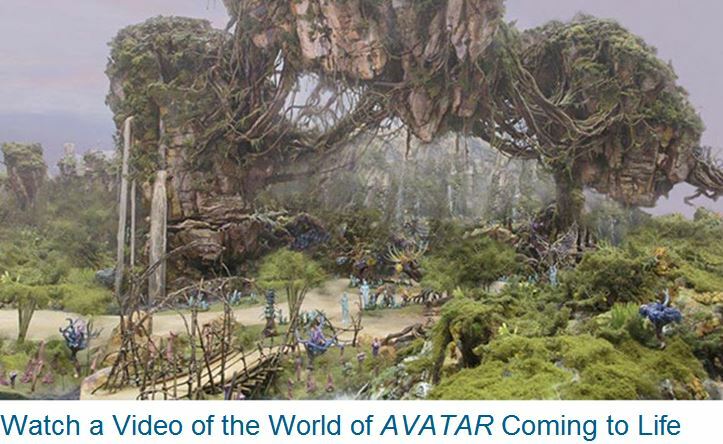 As you can see, Pandora – The World of Avatar will transport guests to a visually stunning world complete with floating mountains and bioluminescent plants. Here, guests will be able to experience two expeditions that will truly push adventure to the next level. The family friendly Na’vi River Journey will send guests down a sacred river hidden within a bioluminescent rainforest. Their journey will end in an unforgettable encounter with a Na’vi shaman, a figure who has a deep connection to the life force of Pandora. And second, the Avatar Flight of Passage excursion will offer the jaw-dropping experience of riding on a Banshee over the world of Pandora. Check out the video above, in which the project team shares how this new land has already exceeded even their own imaginations. When our new nighttime experience “Rivers of Light” opens at Disney’s Animal Kingdom, it’ll be one of the most memorable and emotionally stirring shows in the park’s history. And today we’re sharing a sneak peek at some of the amazing sights the show will offer when it debuts in spring 2016. The show will take place on Discovery River between Discovery Island and Expedition Everest – take a close look and you can you see the Tree of Life in the background. 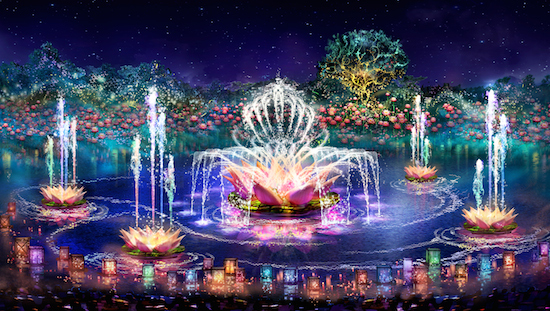 In “Rivers of Light,” a pair of mystical hosts come to the river bearing gifts of light. During the show, the hosts set out from the shore on elaborate lantern vessels for a dramatic dance of water and light to summon animal spirits. With the storytellers as your guides, the wonders of “Rivers of Light” builds to a stunning crescendo. 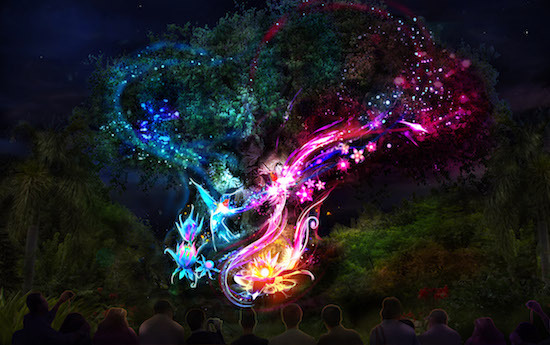 In addition to the show, you’ll also notice the park’s iconic Tree of Life will undergo an amazing awakening as the animal spirits of the tree are brought to “light” by magical fireflies, revealing moments of wonder and enchantment. To create “Rivers of Light,” Imagineers and Creative Entertainment partnered with the talents of master puppet designer Michael Curry, composer Mark Mancina and the filmmakers at Disneynature. According to Imagineer Joe Rohde, the addition of “Rivers of Light” to the park’s offerings will serve as that huge “wow” moment that ends a guest’s visit to the park. 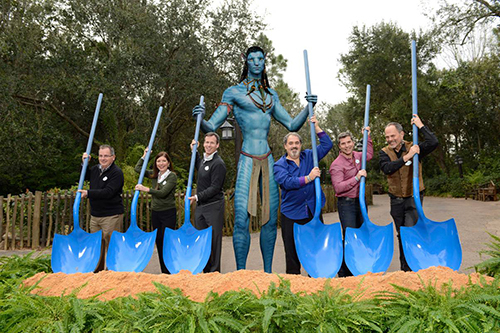 “Since we first broke ground last year at Disney’s Animal Kingdom, we’ve been looking forward to welcoming guests into Pandora, the mythical land based on the blockbuster film AVATAR. We’re having a lot of fun dreaming up ways to bring to life the land’s iconic elements from the magnificent floating mountains to the interactive bioluminescent forest, and even to the soaring banshees. This creative process has been one of the most dynamic and collaborative ones we’ve ever undertaken. 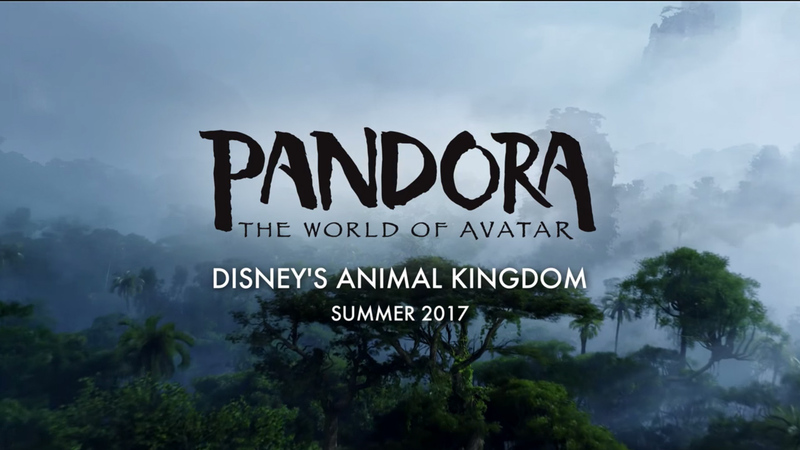 It began when our then-Chairman of Disney Parks and Resorts proposed to James Cameron that together we might recreate the world of Pandora at Disney. Since that time, our creative development team, led by Joe Rohde, has been working hand-in-hand with Jim, Jon Landau and their team of artists and designers at Lightstorm on every aspect of this project—from overall design to the smallest—yet crucially important—details. And along each step of this process, Tom, as well as Disney CEO Bob Iger have been actively involved in helping guide the creative vision that is shaping the extraordinary world we’re building. We all recently got together at our offices in Glendale, California and walked through the fantastic progress on the whole land—including the awesome experience of seeing Pandora while riding on a banshee. This week’s milestone is just the first step in a larger expansion for the park that will also include the debut of a new evening spectacular, as well as a nighttime version of Kilimanjaro Safaris.